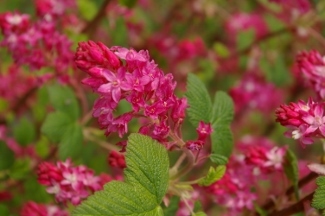 Joy Creek Photo Archive (c) all rights reserved Perhaps it is quibbling over minor differences, but the flowers of Ribes sanguineum 'Mesa Red' have more violet in their red. The hummingbirds don't seem to mind however, and the shrub provides them with both food and nesting cover. Spring. 10 ft. x 8 ft.